I thought this might be interesting to those who knew the Club Tempo at Highbury Corner in the late 1960s. It used to be the Temperance Billiard Hall. 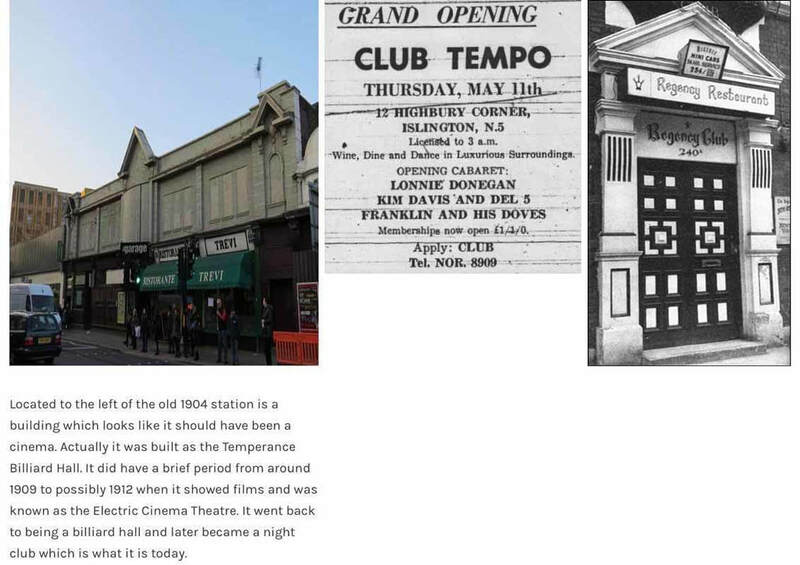 “ … A significant and exciting club and cabaret development was heralded last week by the opening of the Club Tempo at Highbury Corner, Islington. Club Tempo, formerly a billiard hall, was opened in 1967 by Ray Grehan, a Scottish entrepreneur who was based in Newcastle Upon Tyne. I have vague memories of going to see the Lonnie Donegan appearance with James Sanderson that night. Can you confirm please, Sandy? Was much better as a billiard hall. Could get a nice cup of tea and a lovely steak and kidney pie in there. A misspent youth with our Vespa GS scooters parked outside. Great times. Warm memories of the billiard hall and the delicious rat pies. Did the Kray Bros own a club in Seven Sisters Road between Hornsey Road and Finsbury Park? This is an incident I remember when I lived in Finsbury Park and might be the establishment referred to, nothing to do with the Krays though. Very interesting article, Micky. I can remember passing Pentonville Prison on the way to Barnsbury School when hangings were being carried out, and I remember that there was always demonstrators outside. Afterwards they hung a board outside the main door saying that the hanging had been carried out. Not all my childhood memories are good ones. I remember that as well John. They got on top of the bus. I think it was Ronnie Marwood that they was hanging. A local man from Huntingdon Street if my memory is OK. He stabbed PC Sumner in Seven Sisters Road. Gentlemen, as the subject of the Kray twins seems to have cropped up, it may interest you to know that ex-Barnsburian and good friend of mine, David Proctor, and his wife Sue, lived for several years in the Kray’s country retreat at 'Hollyberry' (I don't know if this was the original name). The Krays had this nightclub in Amhurst Road, Stoke Newington called the Regency. Thank you, Ray Silk for the Regency club doorway. The club was owned by the Barry brothers but “overseen and minded by the twins.” In my early 20s after the pubs closed, I recall going there with a few friends first to have a Chinese meal in the side section and part of the Regency run by a sweet Chinese lady called Doreen. There was live music, singing and dancing with fighting a rare occurrence for the obvious reason. Around 2 a.m. for those still there everyone was shuffled to the basement behind double doors to “enjoy“ further drinks. It was quite scary being locked in wondering how to get out quickly if trouble erupted. Interesting memories which I am sure other members would be familiar with.